I'll be danged if this 00-42 didn't screw up my whole day. Here I was, going about my business and being productive, then I say down with this serial and promptly lost track of time. I'll be running around like my hair is on fire for the rest of, but it was totally worth it to lose myself in the inviting sound of this beautiful 000. So, why is it so addictive to play? Well, for starters, its bass response is the cat's meow. The low end is assertive and present, but it's not so thunderous as to be overpowering. 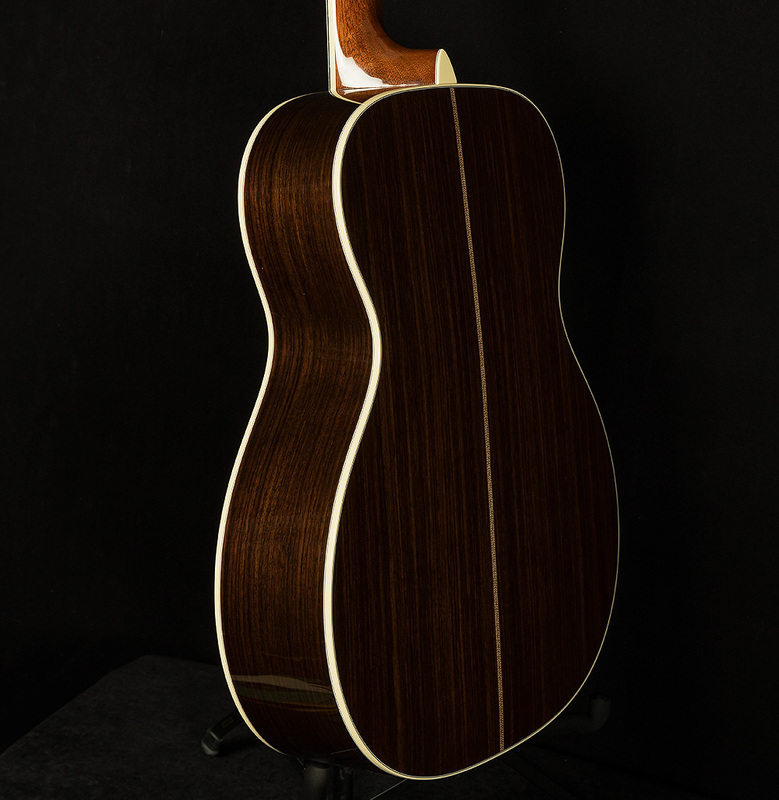 Rosewood's signature glassy top-end shines and sparkles just as it should, and the highs are quite touch sensitive. They're smooth and round when you ease off, and they get brighter and sparklier the harder you hit. 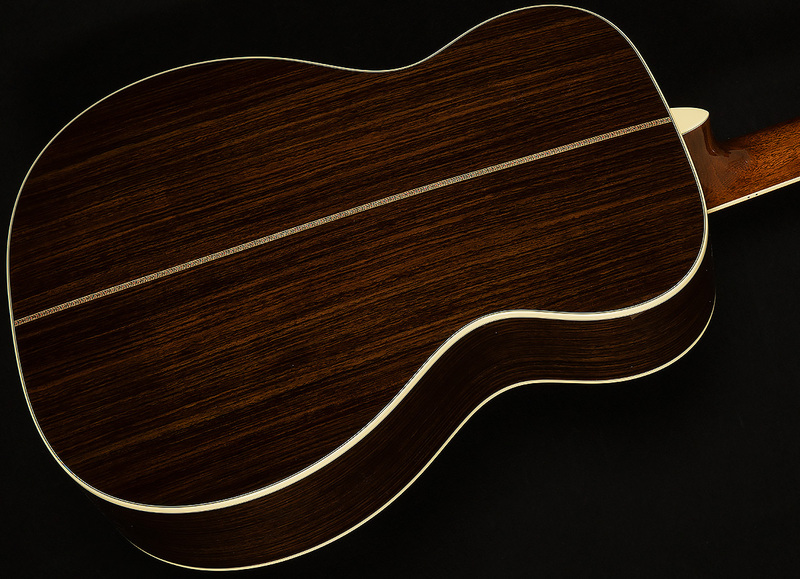 Many guitars equipped with rosewood back and sides have a bit less midrange response, but that is not the case here! The fundamental comes through loud and proud in the low mids, and the harder you hit, the more midrange overtones you can pull out of the spruce top. Speaking of hitting hard, this 000-42 has a greater capacity for meanness and grit thanks to its remarkably articulate attack. It'll sound pretty all day long at normal dynamics, but if you ever want to dig in, you can get plenty of gutbucket percussive thwack on the front end of your notes. It's really a cool sound, because after that initial thwack lots of really pretty overtones bloom out of the top. This 000-42 has a remarkably wide dynamic range, and it makes for quite an expressive playing experience. Personally, I couldn't stop strumming this serial with a flatpick. It really fills up the room! It sounds so big and piano-like that I found myself overjoyed with how full and rich simple chord progressions sounded. I think I played D, A, and G exclusively for five minutes as I marveled at its huge resonance. Every time around the progression, I tried to alter my picking to change the timbre of the guitar. Simply by changing your right hand dynamics, you can make the same three chords ring out in a bunch of different ways. Of course, this touch-sensitivity and full resonance also make it an excellent choice for fingerstyle players. 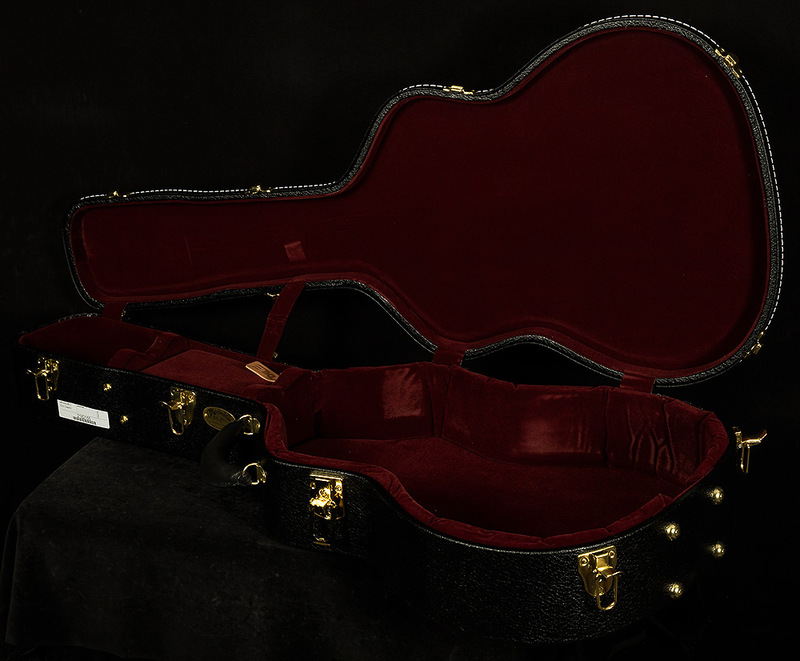 You can coax lots of different timbres out of the strings at low and medium volumes, too. Furthermore, each individual note has plenty of mass and weight, though never enough ot impede clarity. 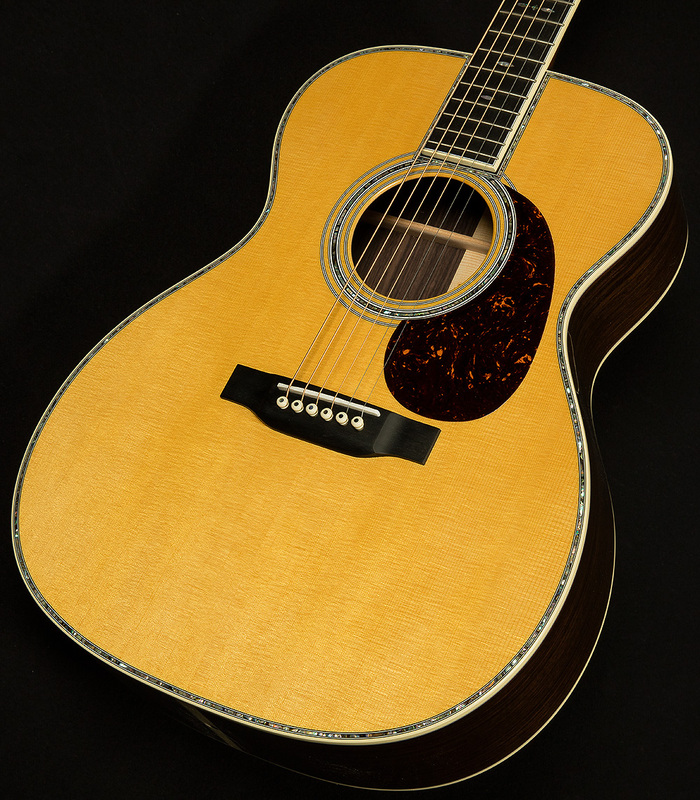 Anyone searching for a versatile 000 with plenty of dynamic range and full resonance will love this opulent 000-42. 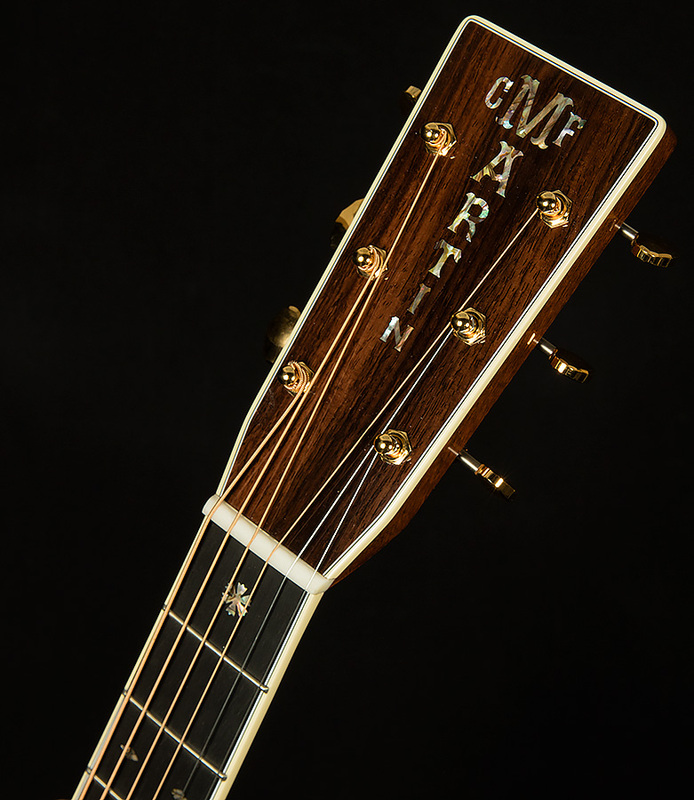 I'm sure it will provide you with a lifetime of inspiration on all your acoustic adventures.